Every presidential election year, the youth vote is supposed to make a difference -- and many candidates claim they will be the beneficiary. Before the 1988 Iowa caucuses, I got a phone call from a George H. W. Bush campaign operative who told me his campaign had canvassed Iowa high schools for young supporters, and our pre-caucus poll had underrepresented this great source of Bush support by not interviewing 17-year-olds. (Iowa allows anyone who will be 18 in time for the general election to participate in a caucus.) But Bush finished third in the 1988 caucuses, and there was no discernible increase in the number of votes cast by 17- or 18-year-olds. Even in Iowa, the state that again starts the electoral process January 3, younger adults are much less involved in politics than their elders. For example, only 76 percent of Iowans under 30 are active voters, according to the state's registered voter list. Ninety-two percent of those 65 and older are. Getting younger people to the polls is a challenge, because fewer young people cross that first threshold - registering to vote - despite efforts like Rock the Vote, Choose or Lose and Vote or Die. However, two-thirds of the under-30s in our last poll admitted they hadn't voted in 2004, though more than two-thirds of them had been old enough to vote in 2004. Only 17 percent were sure that they would participate in a primary in 2008. This group says it is more liberal than older Americans. For example, many Americans, 45 percent, wanted U.S. troops out of Iraq within the year in our poll, but even more of those under 30 did. And in addition to wanting candidates to talk about the war in Iraq, under-30s also wanted to hear about education -- something of less concern to older Americans. 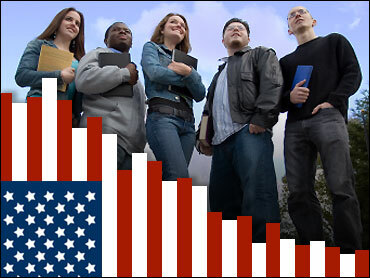 One in three young adults registered to vote said the environment will be extremely important in determining their 2008 vote. Of course, that's if they vote. If they do vote this year, they could make a difference. In Iowa, under-30s favor Barack Obama over Hillary Clinton and John Edwards. If they come to the caucuses, they could make Obama the winner. But although Howard Dean might have been ahead among young Iowa adults in polls a month before the 2004 caucuses, he did not get the largest share of their votes that January. The difficulties campaigns have in encouraging young people to vote are similar to the difficulties pollsters have in reaching them. Under-30 respondents are pretty important: Because they are hard to reach, their responses are likely to get a higher weight than the answers of older respondents. In the recent CBS News/New York Times Iowa Poll, it took extra effort to find people under the age of 30. We had to dial their phone numbers more times to complete the interviews. Young people are just less likely to be at home. Why is this? First of all the under 30 group is less settled and more mobile than the older population. Seventy percent of them in our national polls say they have never been married. Marriage and the attachments that go with it turn out to be excellent predictors of whether someone votes. But the second reason is the one that gets talked about more: Maybe under-30s aren't reached in phone polls because they only use cell phones, not the land line numbers that pollsters typically sample. Although the young are more likely to use cell phones exclusively, they are not alone. Cell phone-only voters (6 percent in the 2004 network exit polls) were younger. Forty-eight percent of them were under the age of 30. But a narrow majority was older than that. Today's telephone pollsters are interviewing some people on cell phones, though they might not know it. Cell phone numbers sometimes are included in the clusters of phone numbers that pollsters regularly sample, either because they are part of phone number clusters that contain listed landline phones, or because people have ported their regular phones to their cell phones. At the end of all our questionnaires, CBS News asks respondents whether we have reached them on their cell phone, and about 1 percent -- sometimes even more -- say we have. These people are usually not much younger than those interviewed on land lines. But these hard to find young voters matter-- and pollsters and politicians will continue to hunt for them!